Adorable SoCo Cottage near Downtown, Zilker, great dining and entertainment! 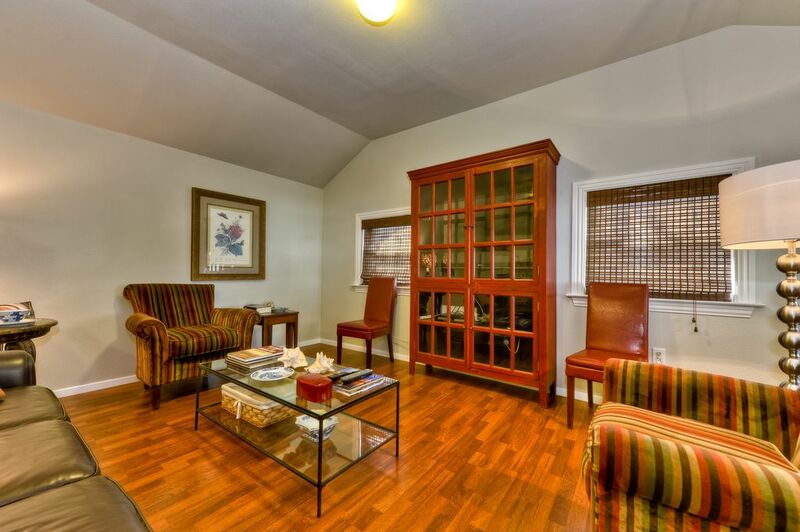 Enjoy this spacious, well decorated comfortable bungalow one block from South Congress in the HEART of SOCO. Close to Zilker Park, Barton Hills, Travis Heights, and Downtown. Great place to stay for Music Festivals, right in the thick of it! Walk to great restaurants, nighttime entertainment, attractions, eclectic shopping, and more! Sink into the Tempur-Pedic mattress for a great night's sleep, then wake to walk to the hike and bike trail along Lake Ladybird. On the way back, stop to enjoy a great cup of joe at one of the many outstanding coffee shops and bistros. Have lunch at an acclaimed SoCo restaurant or try a food trailer for an exciting change of pace! ACL? Less than three miles. SXSW? Just blocks away to enjoy a multitude of entertainment options, less than two miles to downtown. Of course you will enjoy all the comforts when you return from your adventures. Cozy well-appointed furnishings, a fully stocked kitchen, a 50' plasma HDTV in the living room with Blu ray and Smart amenities, and that wonderful Tempur-Pedic bed and 32' LCD HDTV in the bedroom! What's not to like? Keywords: Cottage, Apartment, Bungalo, Casita, Cabin, Flat, Home. Great central location!! Nice clean place with all the necessities. Definitely recommend if your visiting DT Austin. Lovely Place ! Very clean, private and located just a few steps away from South Congress. Elliot was a wonderful host ( listen to him about “Sway” recommendations - most amazing Thai food I’ve ever eaten ). Will definitely return ! Location is perfect for us. Close to all we want to do. Cottage is well kept and Elliott makes it very comfortable to stay on his property. Thanks again Elliott for your hospitality. There is truth in advertising. Elliott's "cottage" is as described on the VRBO website. Since we'd never been to Austin, we weren't sure what to expect, but the SOCO area sounded interesting and it was. The rental is only a block off South Congress, but amazingly quiet on a dead end street that sees no through traffic (unless the church at the end of the block opens its gates before or after services). The February weather was all over the place, and we needed both AC and heat during our month-long stay; both worked great, along with ceiling fans if needed. One nice feature that I don't think is mentioned is the outside table and 4 chairs that are sheltered under the extensive overhang; even it had a ceiling fan for hot days. The inside of the cottage is as described: very comfortable with good seating options, a great TV with many channels, pretty good WIFI, extensive dinner and cooking wares, and a very comfortable mattress. Elliott is an excellent host. Even though his house is close by on the same property, he respected our privacy, but was quick to respond to any needs or issues that arose (even some wine and coffee and an extra blanket that was needed on cold nights!). Although it's a seasonal plus, his orange tree was ripe when we were there; the provided juice squeezer was wonderful, and we took some oranges back to MN with us. As mentioned, the location is excellent. We could easily walk to a variety of good restaurants and music venues, plus the large HEB grocery store is only a couple blocks away. We had our dog with us, and the rental worked out great for her: comfortable inside and a nice grassy area right outside the door for basic needs. If you've never been to Austin, it's got to be the friendliest dog city in the country: lots of places to walk on leash, and a wide variety of off-leash parks that are easy drives (Red Bud Isle is fantastic!). All in all, Elliott's place was a perfect stay for us. Highly recommended. Vince and Bonnie it was a pleasure having you! So glad you enjoyed your stay... hope to see ya'll soon!!! Very convenient location and comfortable furnishings! We are located in the trendy area of South Congress, close to downtown, known as SoCo. Refund Policy is limited to 60 days before hand for ACL and F1 for partial refund.